Whenever we speak about Bollywood actors and their fitness, a few names come to our minds. Among them are actresses Malaika Arora and Shilpa Shetty, who have been known for their penchant for fitness. And the two have been inspiring their followers on social media by posting pictures and videos of their routine. 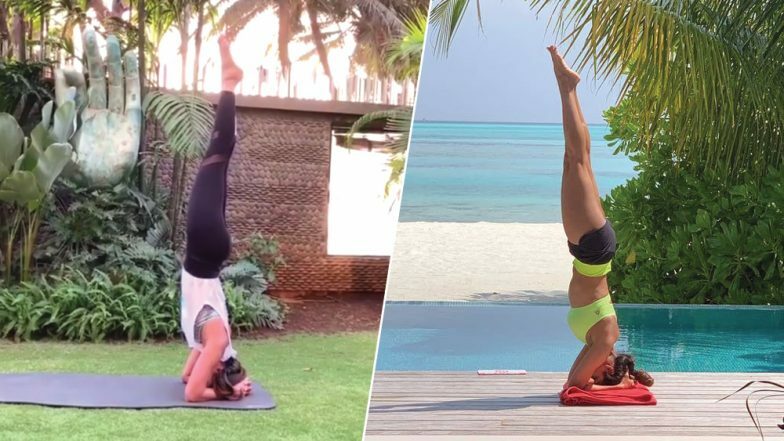 Recently, the "Chaiyya-Chaiyya" girl Malaika and Dhadkan actor Shilpa Shetty shared the video of them doing Sirsasana Yogasana on their respective Instagram pages. Shilpa Shetty’s Secret for a Flat Tummy? Planks! How to Perform This Core Strengthening Exercise. Both the Bollywood divas Shilpa and Malaika coincidently shared similar Yogasana posts on the same day. Shilpa Shetty regularly uploads videos of her doing Yoga exercises on her social media account. While Malaika Arora runs a Yoga studio in Bandra, Mumbai under the name Diva Yoga. Bharat Actor Katrina Kaif Does Yoga with Michael Phelps as She Trains with The Olympian. Yoga is good for flexibility, body balancing and strengthening the core muscles. It also reduces stress and improves the blood circulation of the body. Asana like Sirsasana should be practised or performed under the supervision of certified Yoga trainer. Sirsasana can help enhance the hair, as headstand enables nutrient flow to the head and scalp. Headstand helps the flow of oxygen to hair follicles, thereby making the hair healthy. It also requires quite a bit of practice. And seeing the two pull off the asana with so much ease, it's clear that Shilpa and Malaika have tremendous control over their bodies. Through her posts, Shilpa tells her fans that she ensures she burns anything she eats. She wrote in her post that she is trying to burn the two chunks of Mysore pak which she ate the day before. Shilpa Shetty did some asanas like Hasta Uttanasana, Padahastasana, Ashwa Sanchalanasana, Utthita Chaturanga Dandasana, Ashtanga Namaskarasana, Bhujangasana, Parvatasana, Shirshasana, Utthita Chaturanga Dandasana along with dynamic Surya Namaskar.